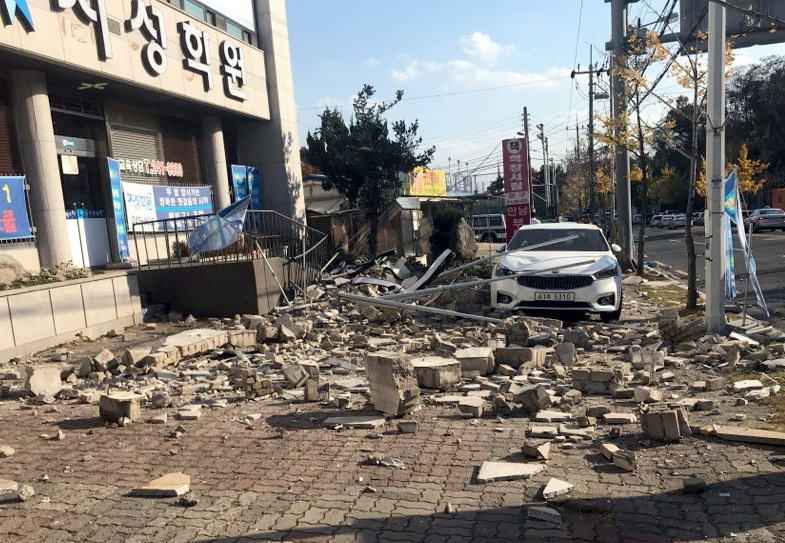 South Korea was hit by the country’s second biggest ever earthquake of 5.4- magnitude, with no serious casualty being reported yet, the weather service said Wednesday. The 5.4-magnitude tremor struck an area, 9 km north of the southeast coastal city of Pohang in North Gyeongsang province at about 2:29 p.m. local time (0529 GMT), according to the Korea Meteorological Administration. The seismic intensity was the second biggest in the country’s history after the biggest ever quake of 5.8-magnitude hit the Gyeongju city, just south of the Pohang city, in September last year. No serious casualty was reported yet. As of 3:00 p.m. local time, four minor injuries were reported, according to the firefighting agency. The weather service revised the magnitude from an initial 5.5 to 5.4 after a rigorous analysis. The epicenter, with a depth of 9 km, was at 36.10 degrees north latitude and 129.37 degrees east longitude. Before the main tremor, earthquakes of magnitude- 2.2 and 2.6 struck areas near the Pohang city. An aftershock of 3.6-magnitude took place in an area 7 km north of the coastal city, followed by third and fourth shocks. According to local TV footage, some of the buildings saw external wall damaged and window broken. Electric lamp hanging from the ceiling was shaken, with books falling from a bookshelf. Some passenger cars were seen broken as external walls fell on roof. Students were evacuated from school buildings and people stood on the streets after dashing out of office buildings and apartments. The quake was sensed across the country, including the capital Seoul, some 270 km away from the Pohang city, as well as the southern resort island of Jeju, according to local media reports. Nuclear power plants were being normally operated, according to the Korea Hydro & Nuclear Power, an operator of the country’s nuclear reactors. Most of South Korea’s atomic power plants are located along the southeast coastal area.